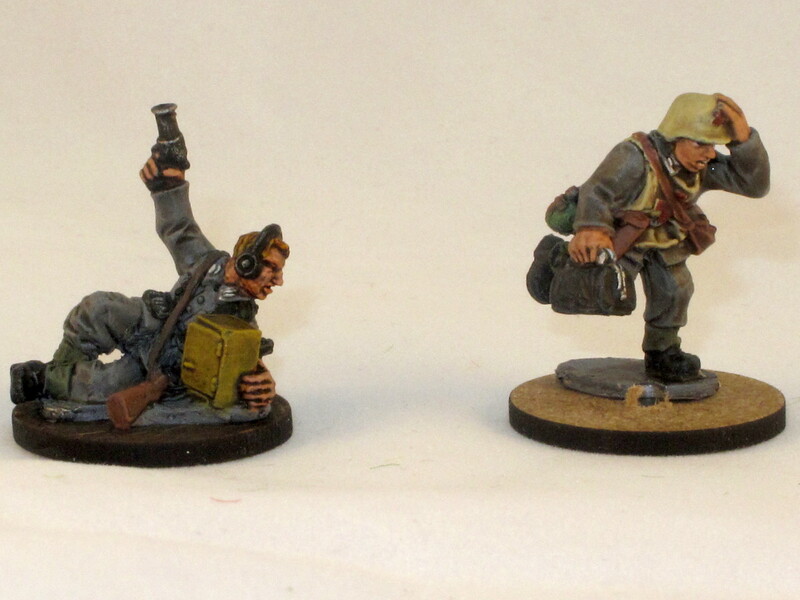 Which Army Painter Quickshade to use on Germans? Army Painter recommend their strong tone Quickshade whenever you’re in doubt which one to use, and this is advice I’ve followed for pretty much everything I’ve painted. Dark Quickshade (left) vs strong (right). 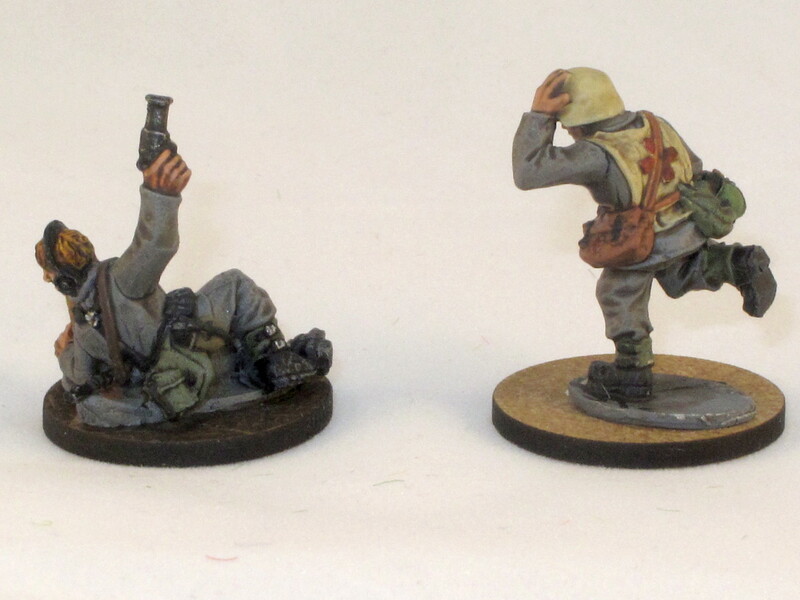 Note how brown the shading is on the medic’s arms and legs. The problem is that the strong tone is a brown pigment, but the dark is a black pigment. I think the black is a much nicer effect on a grey uniform. Army Painter do recommend dark tone for greys on their site, maybe I should have heeded that advice, but Quickshade is quite pricey, and I wanted to see if I could simply use strong for everything. As well as shading the grey uniform better you can see that the dark tone has picked out the detail on his web kit slightly better. The top face was done with strong tone, the bottom with dark tone. One issue I have found is that the dark tone isn’t great for shading flesh. The hands turn out OK, but the black shading on faces looks a little unnatural. 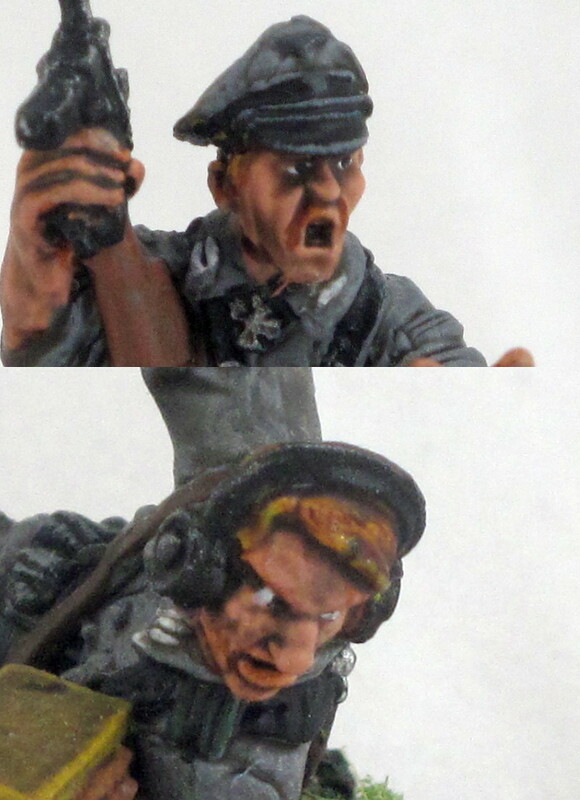 You can see this on the face of the mortar observer to the right. The black pigment doesn’t look right to shade Caucasian flesh. I’ve got around this by using the splash on method instead of dipping. This way you can avoid putting dark tone on the face and instead use a dot of strong tone.